Technology plays an integral role in patient safety and satisfaction at The Art of Dentistry. Dr. Robin Rutherford and his entire dentistry team strive to maintain a constant connection with the latest developments in dental technology. With a commitment to continued education that far exceeds the minimum requirements defined by his profession, Dr. Rutherford has completed more than 400 hours of advanced dental study in a range of topics, including dental implants, porcelain veneers, and sedation dentistry. Very friendly, professional staff. Genuinely dedicated to keeping their patients healthy. They’re also very innovative, making use of the latest in dental technology. The transition from 2D to 3D Dental Cat Scan imaging is a new innovation in the field of dentistry. Dr. Rutherford recently attended the annual meeting of the International Congress on 3D Digital Imaging to ensure his practice is utilizing the i-CAT Precise Cone Beam 3D imaging system to its full potential. Dr. Rutherford is also exploring the application of 3D Imaging in other areas of dentistry, such as sleep apnea, TMJ, and airway evaluation. His ultimate goal is improving the level of care at The Art of Dentistry, and he believes advancements in technology present the opportunity to continue to do so. Oral cancer screening is extremely important for the continued oral health of our Odessa, Midland, and surrounding area dental patients. VELscope® is an enhanced oral assessment technology that allows Dr. Rutherford and his hygienists Dana and Beth to detect oral abnormalities with greater accuracy and precision. When coupled with a routine dental exam, the VELscope® system helps our team detect irregularities in roughly two minutes, without any added pain or discomfort. The VELscope® system uses a special light that illuminates suspicious tissue that could potentially contain cancerous or pre-cancerous cells. Dr. Rutherford recommends patients undergo an oral cancer screening at least once a year. The chances of surviving oral cancer are significantly increased with early detection and treatment. To improve overall efficiency, Dr. Rutherford has incorporated the Digidoc Intraoral camera into routine exams at The Art of Dentistry. The optical instrument is designed specifically for routine usage, with strict attention paid to patient comfort throughout the entire dental exam. The Digidoc Intraoral Camera takes photos of each area of a patient’s mouth, which are then magnified up to 20x on a computer. 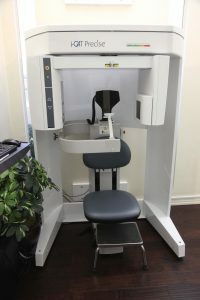 The magnification allows Dr. Rutherford and his team of hygienists to better visualize the mouth and diagnose a variety of conditions, from early decay such as cavities, to cracks in the teeth and receding gum tissue. An added benefit of the intraoral camera is the ability to fully demonstrate the need for procedures to insurance companies. This leads to a streamlined process that helps make the approval process more efficient, which can lead to quicker treatment and less worry about covered treatments. Because this goal of improving patient care from every angle aligns with Dr. Rutherford’s dental philosophy, the Digidoc Intraoral Camera plays a large role in everyday dental care at his practice. Dr. Rutherford’s dental hygienists Dana and Beth use the diode laser to combat a chronic inflammatory disease in patients’ gums known as periodontal disease. The diode laser has a detoxifying effect on the infected area that can free a patient’s mouth of harmful bacteria, and improve their overall oral health. Laser dentistry is virtually painless, and reduces bleeding, recovery time, and the risk of infection. Dana and Beth have been extensively trained, tested, and have completed the Advanced Certification Courses: Soft Tissue Surgical and Periodontal Applications and Hygiene and Periodontal Applications of the Diode Laser. For more information about how the diode laser can help improve your oral health, visit our Laser Periodontal Care page. Certain types of bacteria cannot be removed during gum therapy; however, antibiotics can be effective in these cases. Our dental team can perform a very simple diagnostic test to help us determine the best possible treatment for gum disease. Patient safety is our greatest concern at The Art of Dentistry. For this reason, we maintain a state-of-the-art sterilization station. While we use a variety of single use dental instruments to further increase patient safety, our team relies on a set of non-disposable instruments as well. Following any procedure, each instrument is carefully cleaned, then sealed in a medical grade bag to be sterilized in steam autoclaves. Our sterilization station is comprised of the latest and most effective tools available to dental practices in the US. For more information about the latest advancements in dental technology, or to schedule a consultation for one of the treatments mentioned above, contact The Art of Dentistry today.